A Missouri man out on probation allegedly filmed himself removing an ankle monitor with tools and then posted his “How To” video to Facebook—leading to his arrest. The video on Dustin Burns’ Facebook page shows someone using a butter knife and screwdriver to take apart the electronic monitor—which courts use to enforce house arrest or travel limitations—without damaging it and alerting authorities. “This is how you take an ankle bracelet off,” a voice says, “without breaking the circuit.” Police saw the video, and Burns is now in jail. A passenger was kicked off a flight at the Orlando airport because she carried her “emotional support squirrel” onto the plane. Frontier Airlines bans rodents, including squirrels, from its planes. 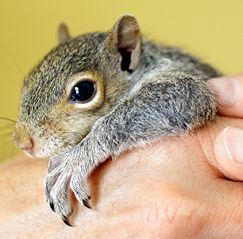 So when attendants on the Cleveland-bound flight spotted Cindy Torok sitting with an 11-week-old squirrel named Daisy in a carrier, they told her she’d have to leave or have her pet confiscated. Torok refused, saying, “You will not take my baby from me!” She was escorted from the plane by police officers, and now says she intends to sue Frontier Airlines. “I’m going for blood,” Torok says.